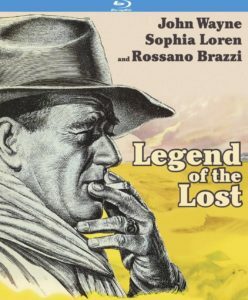 Touting stars John Wayne and Sophia Loren, as well as director Henry Hathaway and a screenplay credit going to the great Ben Hecht, Legend of The Lost gives you every reason to watch. But no reason to keep watching. Of all the major talent listed above, it’s safe to say that Legend of The Lost is no one’s best work. Of the lot, Wayne has a handful of keeper moments. (Not surprising, what with this film hailing from his production company, Batjac). 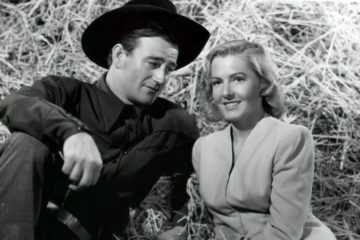 But mostly, his performance consists of him John Wayne-ing his way across the Sahara. A macho alcoholic happy to have a roof over his head, even if it’s a third world local jail’s, Wayne’s character Joe January is a one well-inclined loser if there ever was one. The thing about movie stars, they always know what they’re talking about – in movies. Joe January is nothing if not a constant reminder of that. Ever delivering a string of gruff gripes, he’s always quick to point out what’s a mirage and what isn’t, when to have some water, and which way is a bad idea. Even when he gets fed up and questions the whole thing by saying, “What are we doin’, out here in th’ middle ‘o’ nowhere, lookin’ fer nothin’ in the wrong season!”, he’s not wrong. 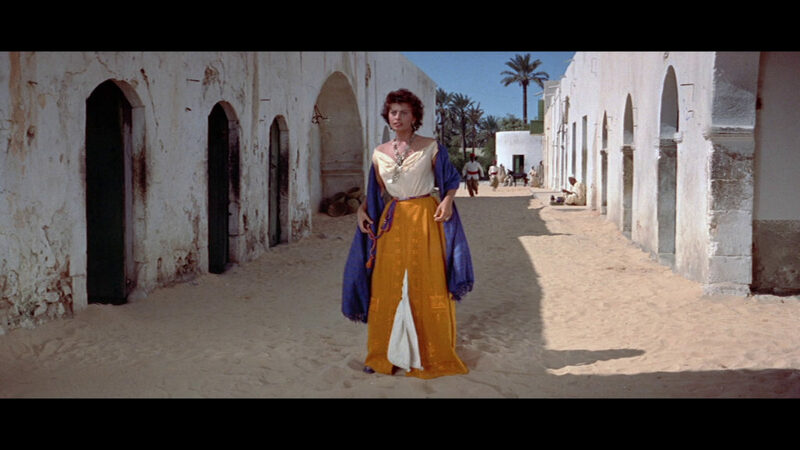 January is sprung from his sentence in order to accompany a wealthy treasure hunter (Rossano Brazzi) across the desert. 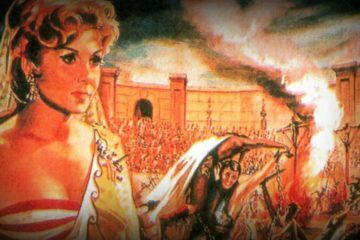 Both men are beguiled then ambushed then beguiled again by a local prostitute Dita, played by Sophia Loren. 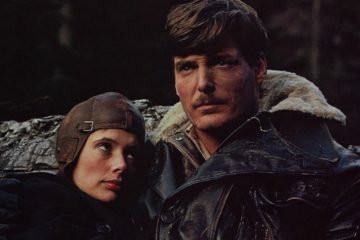 While one couldn’t rightfully say that their expedition is “Hotter than 1000 Suns!”, as the film’s tagline states, Loren’s presence is nevertheless a positive. 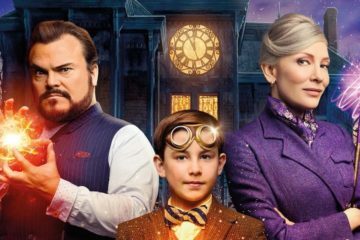 At nearly two hours, it’s an adventure film that forgot to pack the adventure, a diagnosis made worse today by its many inescapable cosmetic similarities to Raiders of the Lost Ark. Is Brazzi dressed like Victor Laszlo from Casablanca, or is Rene Belloq from Raiders dressed like him? Or, is it all of the above? 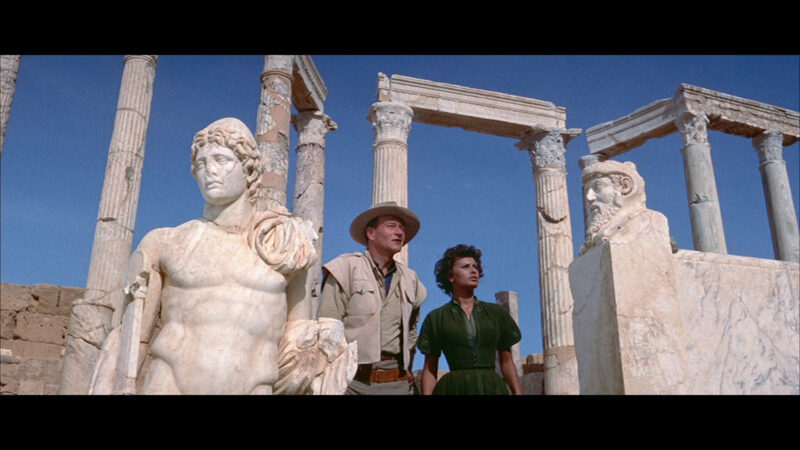 Whatever the case, when things are dragging in the desert town at the beginning, it’s quite easy to imagine a box truck (not) carrying Marion Ravenwood exploding in the street. About twenty minutes in, my wife, my companion for most of my at-home critical viewing, who is fan enough of Wayne et al, opted to take a nap across my chest. This meant I was trapped. First hand, then, I can attest that this is indeed a very large desert they’re ambling across on screen. And they take their time about it. As Christian evangelical culture currently endures an identity crisis it’s yet to realize, perhaps this observation from the mouth of everyone’s favorite right wing icon will be a sixty year-old wake up call. In that sense, Kino Lorber Studio Classics blu-ray of Legend of the Lost arrives at an ideal time. (Even if it has no extra features). The picture quality well serves Jack Cardiff’s (Black Narcissus, The African Queen) nearly-mystical widescreen cinematography, a sun burning brightly and just barely on this side of heated oppression on billowing sand dunes, evoking ominous beauty and precarious death.